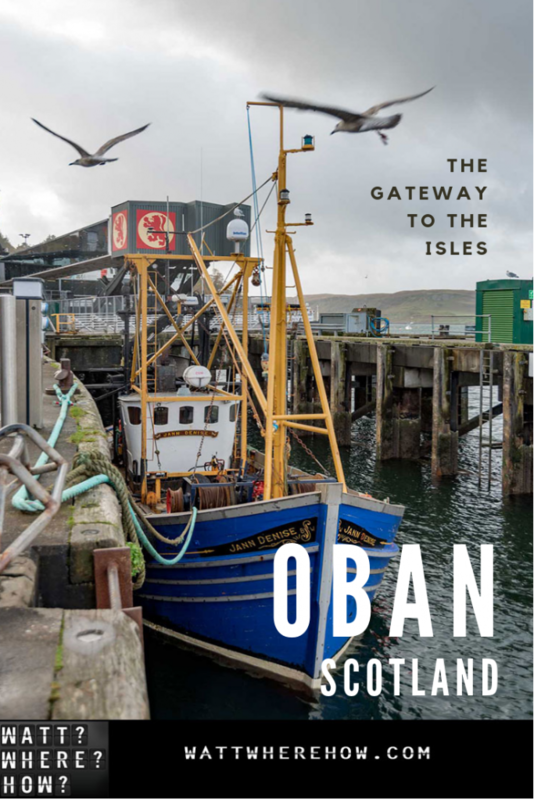 Oban, Scotland's gateway to the isles - WattWhereHow? Oban, the gateway to the Isles is the kind of town where your visit is made or ruined by the weather. On our first time through, en route to Mull, it was blemished by bleak rain squalls and intense winds. The storms made strolling around unappealing and aside from laughing at the shops using Oban as a pun (Oban Sesame) – hey, who doesn’t like a good pun – we basically saw it from the inside of a car. The second time around, we got to experience it at its best (albeit with a sun shower just to show us it hadn’t forgotten we were there). The town of Oban has been a major west coast center for the last couple of hundred years and is now the gateway to many of the islands. Its name means little bay and this little bay is as popular with day trippers as it is with Scottish retirees. 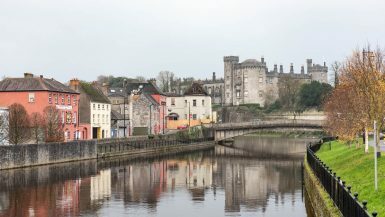 A resort town in its own right, the waterfront is a blend of classic hotels, mill shops and retirement homes. Oban town center is watched over by McCaig’s Tower (or folly), erected on Battery Hill in 1897 by banker and architect, John Stuart McCaig as a monument to his family and as a way to keep local stonemasons employed during the winter months. Today, the stone coliseum stands stoically, looking out over the islands and bay and providing a stunning view of the region. The lifeblood of the town is the bay and its distillery and fishing industry and we make sure we experience both. If you’re a fan of single malt, top shelf Scotches, you may be familiar with the Oban name. The classic west highland drop has been made in the town since 1794. It’s one of our favorites and unlike many of the island scotches, isn’t as peaty as say, Laphroig. Oban Distillery is still only a relatively boutique operation, with two copper pot stills making a million bottles each year. The whole process remains manual, with the human touch employed at every stage of the distilling process. Even the switching of feeds into the spirit safe is done by Oban staff – something that is automated in larger operations like Glenfiddich and The Glenlivet. Photos are not allowed during the tour, but we learn about how the flavors are extracted and change over each part of the distilling. The old dark stone warehouse where the barreling used to take place is now used as a key part of the tour, where we are given a sample of the raw 60%+ barrel ready whisky. It’s like rocket fuel! Finally, we are taken into the tasting room to sample the 14 year, 18 year and Little Bay. They suggest pairing it with blue cheese, smoked salmon, oysters, dishes that are heavy on sage and even chocolate – all winners in our books. Oban Distillery offers a nice surprise gift at the end of the tasting – a quality tasting glass, which will take pride of place in our collection. The distillery’s humble approach means the gift shop is light on range, focusing on the whisky rather than the mementos. 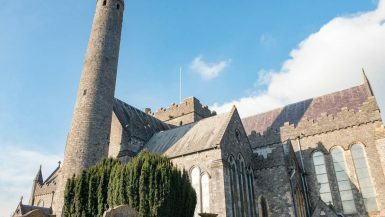 An upstairs bar is an appealing stop for those who’ve got a serious taste for the drop after the initial tasting tour and if we weren’t driving, we would have happily sat in front of the fireplace sipping the fine dram fresh from its source. Oban’s North Pier is the center of the region’s fishing fleets and the main port for Calmac ferries, the vehicular ferries that provide passage to the islands in this pocket of the west coast. The pier’s light-on in the attraction department with boutiques full of the kinds of clothes that would appeal only to someone in their 60s and an ice-cream stand. The biggest attraction is also the humblest, a small shack. Every day, bright colored trawlers head out to sea, bringing back the freshest seafood, with some of the best served at two iconic eateries on the pier. One is an expensive, classy restaurant, Ee-usk; the other is John Ogden’s little green shack. Free of pretense and offering nothing but the best lobster, crab, mussels, prawns and scallops you’ll ever taste, the little green shack has been a fixture on the pier for decades. The owner, local fisherman, John Ogden has battled the local council over the years to stay open and his adherence to high quality and low prices has been repaid by a massive amount of good will and word-of-mouth ensuring the shack is now featured on every travel show and blog’s Oban must-do list. We were lucky enough to visit the shack twice. The first time, Jess stumbled on it accidentally as we went to get our tickets for the Calmac ferry. That time, we picked up crab sandwiches and prawn sandwiches. At 4 pounds each, they are big on value and totally overstuffed with fresh crab and mayonnaise (or prawns). We’ve seen some reviews on tripadvisor complaining about the sandwiches being a little soggy, but when you put so much fresh seafood on bread, something’s got to give and we’ll take bulk fresh crab over white bread, every day of the week. The second visit is on our return from Mull. This time around, we have a little time to sit and take in the atmosphere. A local fisherman in waders is showing off fresh tubs of crabs. 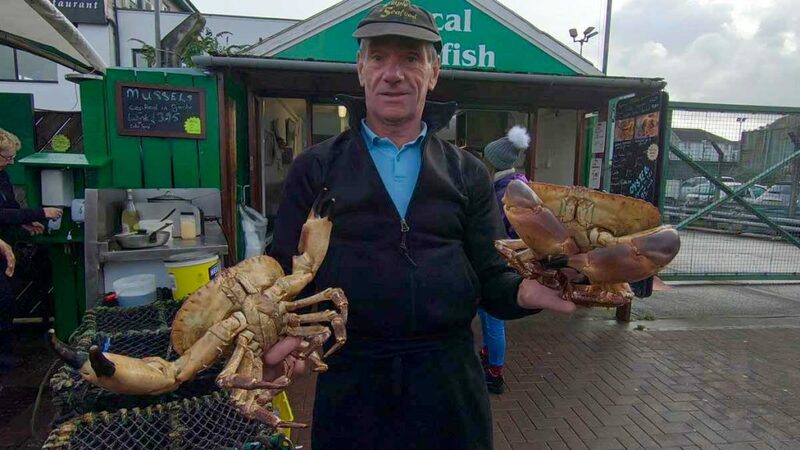 As he rotates the crustaceans (their claws grabbing at him) like a consummate showman, he appears fearless until he points out that the crabs have been declawed. When he’s not taunting tourists, he mans a simple single burner hotplate, cooking up freshly steamed mussels in white wine. Local women serve the throngs of lobster-hungry. Thick Scottish accents fill the air along with the deep-fried oil vapors. It’s the non-biblical version of loaves and fishes, with a better appreciation of plurals and only crappy soggy white bread. Cabinets of fresh lobsters, langoustine and prawns are not only appealing; they are dirt cheap. The most expensive item on the whole menu is a seafood platter for two, coming it at twenty-five pounds. With all this incredible seafood on offer, we buy a serve of the mussels AND the scallops. The mussels are still steaming in their creamy wine sauce in the no-frills polystyrene box as we take them to a communal table hewn from thick natural timber. Here, everyone throws any sense of dining etiquette out the window, consuming their shrimp and scallops voraciously with vocal slurp and garlic buttery splashing out across surfaces and clothes. Our scallops arrive with little fanfare but create the greatest impression. Firstly, they are large. Ridiculously large. They are the size and consistency of giant marshmallows and are drowned in salty, garlic butter and served on a simple base of iceberg lettuce. Oban’s original green shack does not disappoint. Trawler to table doesn’t get better than this. It’s not fine dining, but it’s some of the finest seafood you will ever taste. Oban is a west coast town that is the gateway to the islands of Mull, Staffa and Lismore. Oban is about two and a half hours north of Glasgow on the west coast of Scotland. 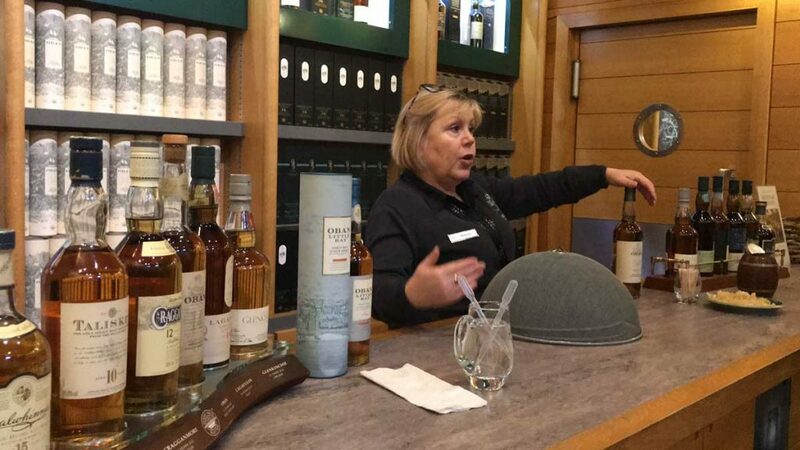 Oban Distillery offers tours for 10 pounds including a tasting and souvenir glass. Book here.